DMP’s Video Doorbell allows you to see, hear, and speak to visitors at your door, all with the Virtual Keypad™ app. 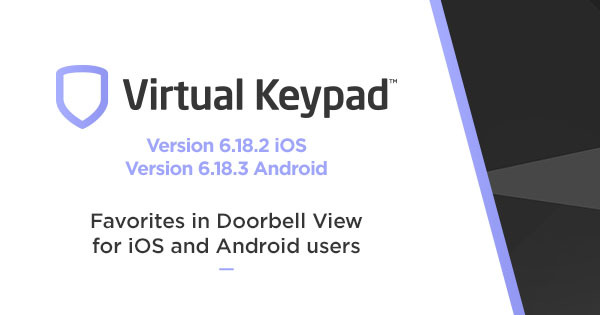 With the app’s 6.18.2 update for iOS and 6.18.3 for Android, add to that the ability to arm or disarm your system, lock or unlock doors, and trigger other Z-Wave devices through the app’s Favorites — all while watching in Live view from your app’s Doorbell tab. Say you've just received a push notification of motion at your door, and you see it’s someone you don’t recognize. You can arm your system and trigger a Favorite to lock the door and turn on the porch light, all from the Doorbell tab. In fact, you’ll have 1080P precise clarity, 180-degree field of view, and Pinch-to-Zoom technology for a closer look. Any time you receive a notification after motion is detected or the doorbell is pressed, you’ll also get a snapshot taken from the doorbell. 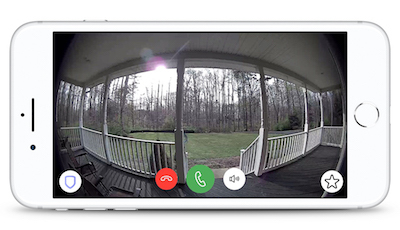 Without having to open the app, you’ll be able to see at a glance who’s at your door. Those snapshots will be stored in the Cloud and available to you in the Virtual Keypad app's History for 30 days. From the app, you can also share these thumbnails as full-size, high-resolution snapshots with other apps, such as your e-mail, or save them to your smartphone. Please review TU-1064 for more information on the Virtual Keypad App iOS Version 6.18.2 or TU-1068 for the Virtual Keypad App Android Version 6.18.3. If you have any questions, please contact DMP Inside Sales at 877-757-4367 or at InsideSales@DMP.com.